Occasionally I read a post on another F1 blog that begs for an answer but then find that there is just too much to say. When that happens, I usually write a post here where I can ramble on at length and not be shouted at for hogging someone else's comments system. Linking to the original article ensures that it receives increased traffic and so everyone stays happy (I hope). Keith Collantine of F1 Fanatic has done it to me again with his question If Brawn GP really are that fast... and so what follows is my long-winded reply. I will start with Keith's suggestions as to the effect of Brawn GP leading the pack and then add a few of my own. Honda made a huge blunder by selling the team over the winter. From our perspective, as F1 fans, this is clearly true. All that work and development of this year's car was paid for by Honda and now the company will not receive the reward for their investment. And yet, this ignores the viewpoint of the parent company. I am convinced that this was a business decision that still makes accounting sense in the prevailing economic climate. Racing has always been important to Honda; it was how they gained notice in the motor biking world and they continued this when breaking into car manufacture. As long as they supplied engines to existing F1 teams, they had a reasonable return on their investment, especially as their engines did a lot of winning. It was all good publicity and helped to sell production cars. When the board decided to extend their involvement into team ownership, however, the figures began to look a bit lop-sided. Running the F1 team proved to be extremely costly and their lack of decent results did nothing for their image. While Nick Fry assured them each year that this time they would win races, they fell to the back of the grid and became an embarrassment. With the sudden collapse of the car market, the thing became unviable; if the company was not to make a big loss in the coming year, it had to get out pronto. Even had the board known that the 2009 car would be so good (and there was no reason they should continue to believe Nick Fry), I think they would have opted to withdraw. It was an accounting decision to stop the bleeding of cash and assist the company through bad economic times. The speed with which the decision was made and announced, catching even the team by surprise, shows that the board no longer considered winning races to be sufficient compensation for the cost of racing in F1. The accountants won and do not see their victory as a blunder - they see only that they have saved the company a lot of money. Let us not forget as well that, if Honda had stayed in the game, the BGP 001 would have had a Honda engine. Whilst I don't believe the tales of the Honda being 60 bhp down on the best engines, it is still entirely possible that Mercedes engines and McLaren ancillaries have helped the car towards competitiveness. We may think Honda have thrown away a winner but it may not have been so good with Honda mechanicals. And how damaging to the company would another year like the last two have been? Their livery won't stay plain white for long. Hopefully, this is correct. One would assume that it is easier for a winning team to acquire sponsorship but these are hard times and spare cash for promotion has become scarce. Much will still depend on Mr Fry's ability to sell the team and the Earth Dream debacle gives me pause on that score. We shall see. Button versus Barrichello will be a fascinating battle. No arguments on that score, although I would expect Jenson to win. Rubens has to slow down a bit sooner or later, doesn't he? It's terrible news for McLaren. Again, no argument. Mercedes may be heavily invested in McLaren but it is not unknown for an engine supplier to swap horses if they feel their original bet was the wrong one. McLaren have had long periods when they were not delivering the kind of results their partner was hoping for and there have been suggestions in the past that the Mercedes board's patience was wearing a bit thin. If Brawn GP is successful, the board will be tempted, at least. And so to my own suggestions. It's good news for F1. For over a decade, each season has amounted to a tussle between two teams, Ferrari and either McLaren or Renault. BMW improved the mix and entertainment value by getting close to the top two last year but they were always an outside bet. The sudden arrival of Brawn GP at the front can only create a much more open championship, especially as Ferrari, BMW and McLaren are not going to capitulate easily. If Toyota and possibly Renault and/or Red Bull live up to testing form, they could mess with the pecking order too. Don't get me wrong - I am not suggesting that there could be a six-way tussle for honors this year. Invariably, some of the teams that have shown promise over the winter will prove disappointing when the races begin. But I would not be surprised to see four teams in the championship hunt, especially as regards drivers. And that has to be good for the sport; five or six drivers still in with a shout going into the last race of the season makes for a cracking good show. It's good news for the superstar designers. I have heard it said that Adrian Newey is the last designer capable of creating an entire F1 car on his own and that, when he goes, we will be into an era of corporate designs for which no one man can claim major responsibility. But it seems that we may have overlooked Ross Brawn's talents in this area - he is an engineer, after all, and has wrought wonderful turnarounds in struggling teams many times in his career. We think of Ross as the tactical genius and great organizer, rather than a designer, but he has had much influence over the design of the BGP 001. It is tempting to think that he is the one who has made the car so good, even though others would have had their parts to play too. Perhaps the superstar engineers have not quite had their day yet. And, while on the subject, whatever happened to Rory Byrne? The last I heard, he had reversed quietly from the Ferrari design office and should now be more or less a free agent. Let us not forget his genius at Toleman, Benetton and Ferrari. Time for a comeback, maybe? David Clarke has been kind enough to do a bit of research on Rory Byrne and supplied me with this link. It appears that Byrne was lecturing in India in October 2008 and is in the process of settling in Thailand (I have a vague recollection of having heard that before). His contract with Ferrari expired at the end of 2008 so this would be an ideal moment for a team like Force India to persuade him not to to retire. Interesting, n'est-ce pas? I couldn't agree with you and Keith more, I was actually going to write my own long comment on that post, but F1 Fanatic gets enough comments as it is. 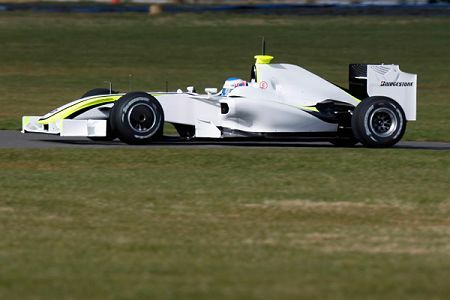 What I find amazing about all the talk surrounding Brawn GP and their testing times was how surprised everyone was. Sure they had a bit of a rush adapting the car to take the Mercedes engine (although is 2 months really a rush) - but other than that they invested heavily for the past 18 months and started on this car almost the day that Brawn arrived. Brawn has long been talking about 2009 being the break-through season and compared the potential to his early days in Ferrari, thankfully the little hiccup along the way (so far at least) seems not to have caused them many issues. Hopefully with the in-season testing ban and Ferrari and McLaren seeming to struggle in different ways Brawn GP could have the fantastic season they and Button (or even Barrichello) really deserve. Unless of course BMW have been doing a little sandbagging again, which I think you're hoping for too ;) If BMW or anyone else do start the season with KERS then they could easily undo anybody else's hard work during an entire lap just on the straight from what I've heard. Ohhh I can't wait until Australia!! Cheer leading doesn't fit the culture of commentary on this blog, but I am all for Ruebens getting his day. He shouldn't have had to take a back seat to anybody. I hope he seizes this opportunity, and really fights. David: I have to admit that I was as surprised as anyone by the Brwan GP's pace right from the start. Even if it were still a Honda, who would have guessed that Ross would make so much difference to a team that has been awful for two years? I think I expected the car to be midfield at best. But you're right, we should not have been so astounded - ignoring the muddle over the sale (which obviously did not have too much effect on the team), the car is what we expected as soon as Brawn went to Honda. The guy is definitely more than just a master tactician! Rubens has been fired up in Brazil for a mountain of criticism. I think he is more determined than ever to prevail over Jenson (and if he had the chance, over the entire field too!) and show at least this time his class. What is good is that it is not personal against Jenson, but a personal vendetta against some from the silly Brazilian press. You, Clive, cant believe in what this guy has been reading about him here in Brazil! Sometimes God is ironic, isn´t? Becken: I agree absolutely - Rubens deserves to have a decent car and the chance to go for the win at last. If he proves quicker than Button, I'll not begrudge him his victory one bit. But Jenson has had his tough breaks too, not least the fact that he is regularly made fun of in the British press. When they pump up expectations and then you don't deliver, the Brits can be as hard as anyone - and excuses about equipment won't be heard! Blunders....IF and it is still a big IF, BrawnGP beats Ferrari this season will they rue the day they let Ross Brawm go? Still, 6.30 PM local time here and we'll all know. I hope you guys in the UK & Europe enjoy the revised viewing time...........courtesy of Bernie and, if you are so important to his viewing figures, why is he intent on hacking you all off and moving the show to the east where nobody gives a damn. I know the answer, but I just felt like writing it. Hah, I should think Ferrari are already ruing the day Luca got rid of the dream team. The success of Brawn GP would merely rub salt in the wound. Too many people underestimated Ross Brawn as he was with Honda, which has been performing rather inadequately for many years. The part I felt the hurt for Brawn was when Stefano Domenicali turn him down with the Ferrari engine supply. If I were Brawn my head will hang down in pain. Please remember Brawn made history when he was with Ferrari. Now with the Mercedes engine BGP posted the best timesheets. For sure, during his sabbatical year he was already planning for a return. It would be great and it will surely happen that BGP will be in top form for 2009. I wouldn't be surprised if BGP take both titles for 2009. I'd like to wish Brawn and his team all the best and 2009 will certainly be much much more thrilling than 2008. It's only 10 days to the first practise!!! JohnBt: I don't think Domenicali turned down Brawn regarding a Ferrari engine supplier. Ross is on record as saying that they considered both the Ferrari and the Mercedes engines but the Mercedes won because it was going to be easier to fit it into the space intended for a Honda. As far as I know, Ferrari would have been happy to supply if so requested.